Blue Recluse plays a wide range of blues, rhythm and blues, and country blues from the ‘40s to the present day. Powerful, sultry vocals in combination with a hard-groovin’ rhythm section and classic electric blues guitar and keys makes this band a blues lover’s dream. 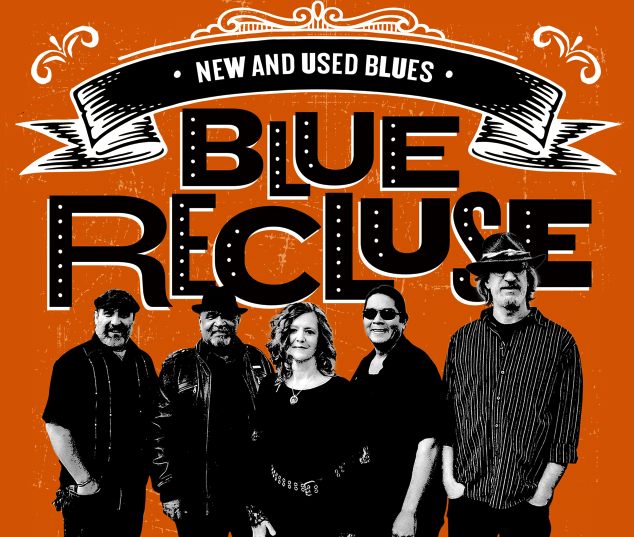 Put on your dancing shoes, because Blue Recluse will rock your soul with its unique brand of rare and classic songs by the likes of Koko Taylor, Etta James, Big Maybelle, Susan Tedeschi, Bonnie Raitt and Janis Joplin, as well as original songs like Run Me Ragged and South Austin Blues, with a traditional Chicago blues feel. SHAWNTEL ROYALE began her music career in Austin, Texas, as the lead singer of the R&B/blues band, Blue Recluse Featuring Shawntel Royale. The band played at the legendary Antone’s, and helped close the Guadalupe location with blues greats Jimmie Vaughan, Lou Ann Barton and Angela Strehli. Blue Recluse was the regular opener at the Continental Club on South Congress for Miss Lavelle White. In 2005, Royale relocated to Colorado and reformed Blue Recluse. Her powerful vocal style reflects the soul of her heroes: Koko Taylor, Etta James and Big MayBelle. MICHAEL TWAROGOWSKI has been playing blues and rock guitar around Colorado for the last 30 years. Musically educated at the School of Life, Twarogowski’s playing is raw, edgy and soulful. He plays from the heart like many of his heroes: Albert Collins, Eric Clapton and Stevie Ray Vaughan. CHRISTOPHER HUDSON has been playing both acoustic and electric bass in the mountains and on the Front Range since the 1980s. His repertoire includes latin jazz, swing, blues, rock, country, bluegrass and blues. He has played with The Green Bean Boys, Bob Purcell and the Outriders, Drew Emmitt, Romano Paoletti, Buckskin Stallion and Free Beer. His influences are PinoPalidino and Gary Granger.